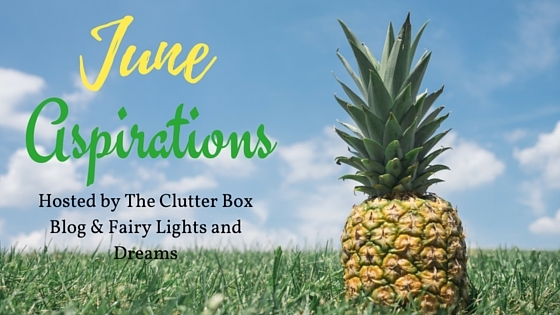 Welcome to another Monthly Aspirations Link-up hosted by Angela from The Clutter Box Blog and me. This is a place where you can share what your goals are each month. We created this link-up in hopes to build a community that encourages, supports, and motivates each other. The link-up will launch the first of each month and will be open for two weeks. So feel free to add your monthly goals to the link-up below. Summer is officially here and although I love the outdoors the summer heat is literally exhausting me and the summer just started. This month and summer, in general, is going to be fairly busy for me so hopefully I'm able to get some of these goals accomplished. Tomorrow I'll be headed to Cedar Falls, Iowa for orientation and then two weeks from now I'll be headed to Clive, Iowa to spend the summer with my boyfriend all the way till July which includes a trip to California to see his family. As soon as I get back it'll be lots of packing for college the following month. It'll be fun but it'll also be busy. So I'd love to accomplish some goals this summer. Last month I did manage to accomplish a few goals. I feel like the time just went too fast and before I knew it, it was June. I hadn't accomplished everything I wanted to but I'll take some goals over none. I thought this goal was going to be easy however the twitter chat I managed to forget every Sunday to participate in the Blogging College twitter chat. Not to mention I searched a few twitter chats up and it looks like they've changed the times so I was unable to really find some new ones. I'm adding this to this month's goal list. So hopefully it works out. I do have several post written and edited on my laptop now it's just the process of scheduling them in on Blogger. I'm excited to show you guys what I have in store for this little space this summer. So I didn't quite master this. Snapchat is still a mystery to me. I only make stories when I'm out doing something other than that I tend to not snap too much. I'm hoping this summer I'll really get the hang of it and figure out how to use it for my blog. This was actually easier than I expected it to be. Every time someone gave me a compliment I had to say "Just smile and say thank you. Return the favor" I'm sure there must have been a few times I rejected a compliment or two but for the most part I'd say "Thank you." It actually helped me feel better about self too. I feel like I did pretty alright on my May goals. I'll be making more time for this month's goals. I mentioned in my Monday Mantra that I'm not a go with the flow person. I overanalyze everything in my life even the things I clearly have no control over. It's just a bad habit I've always had. It's not always a bad thing however sometimes it can be. So this summer I want to practice letting go which won't be so hard since I'll be around the one person in life that loves this concept of "Whatever happens happens". I'm still holding myself accountable for this. It only takes up an hour of my time. I think it's a fun way to get to know people it makes me sad that I still wasn't able to accomplish this last month. So I added to my list again this month. I think I'll be using an alarm to help me remember. Whenever I'm around my boyfriend we're not really on our phones a lot. It's one of the pros of being in a long distance relationship we value our time together and we know we're not together for long so we tend to spend it almost tech free. However during my California trip, I want to spend it entirely tech-free for the whole week besides blogging related promises and using my camera. Other than that I don't want to be on Twitter, Facebook, Snapchat, or Pinterest (unless it's looking up recipes to make). We both agreed to this, so it should be exciting to see how it turns out. 4. Start scheduling in some blog post for this summer. I have all these blog posts written for this lovely space, now it's time to start scheduling them into the Blogger which is what I'm trying to do before I get my summer officially started. This gives me about 2 weeks, so I need to get a move on. What are your goals for June? How well did you do with your May goals? Let us know and don't forget to add your monthly goals in the link-up below.